The last time Stockholm’s Royal Opera mounted Tchaikovsky’s operatic masterpiece (in 1982) it was sung in Swedish but given its original Russian title, Jevgenij Onegin. The latest staging, premiered on June 10th, is being sung in Russian but the title has been switched back to the Westernized Eugene Onegin. However, Russian it is in several other respects. Besides Austrian-born set designer Hartmut Schörghofer and French light designer Franck Evin, costumes (Tatiana Tulubieva, who works all over Russia) and choreography (Edvald Smirnov) are by Russians and the director is Dmitri Bertman, who actually is the founder of the ever more popular Helicon Opera of Moscow. The conductor, Alexander Lazarev, is well known in concert halls and opera houses all over the world. Between 1987 and 1995 he was chief conductor and artistic director of the Bolshoi. Two of the singers are also Russian speakers. 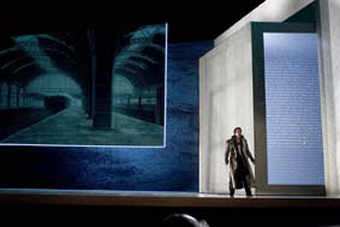 The opera is set in a more or less abstract milieu on a heavily slanted stage and accordingly leaning wall, reminiscent of German expressionist film of the 1920s. Out of this wall a cubical room can be slid onto the stage, primarily to represent Tatiana’s room. The walls are filled with quotations from French literature of the period, read by young intellectuals in Russia (in this case Les liaisons dangereuses (Dangerous Liaisons) by Choderlos de Laclos). Why this slanted stage, which isn’t exactly easy for the actors to walk on? 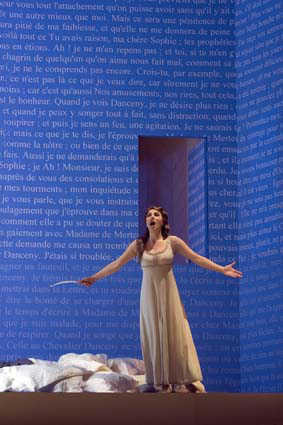 Well, life isn’t easy either, especially in this opera with its mental ups and downs. The costumes are more or less timeless, anyway not Pushkinian, rather contemporaneous of the work (1870s). Olga and Lenskij play badminton, there is a photographer at the party scene in Act II and Onegin travels by train when he leaves Russia after the duel with Lenskij. It is a beautiful opera with sparse scenery, the costumes mostly in pastel colours, although the doomed Lenskij is in black, the virginal Tatiana in white and the untouchable Onegin in silver. All of this underlines the gloomy atmosphere of the opera. But, uniquely for an Onegin production I would think, there are also a lot of sprinklings of humour, not least Marianne Eklöf’s Larina who causes not a few giggles in the audience, which is refreshing. It is arguable, though, if Onegin’s slap-stick servant in the duel scene is such a good idea, considering the outcome of the duel. It is indeed amusing with this jerk, but he belongs more in the comedy theatre. As an impersonation it is skilfully done. Ola Strangeways was well worth his flowers at the curtain call. Lazarev doesn’t overplay the sentimental side of this score, but finds a good balance between the lyrical and the dramatic moments, once or twice actually drowning the singers, but generally he draws excellent playing from the orchestra, which has been in uncommonly fine fettle lately. The surging string melodies have real Russian glow and the many instrumental solos, not least the clarinet, Tchaikovsky’s calling-card in a way, get their due. The opera chorus never let anything down, although their most important contribution in this performance is as “crowd” people – especially in the Polonaise, which normally is the start of the party at Prince Gremin’s, but here has the function of an interlude between the duel scene and the party scene with the chorus members dressed in black with black suitcases (mourning Lenski’s death) and after a while playing at a railway station (to indicate Onegin’s travels to foreign countries) where they perform a fascinating, slightly surrealistic ballet sequence, (according to the programme book, this is the most advanced choreographic achievement ever for the Royal Opera Chorus), and then we are imperceptibly transported to Gremin’s party and the final meeting between Onegin and Tatiana. It should be pointed out that the opera plays continuously with only an interval between the two tableaux of Act II, i.e. between Tatiana’s name-day party and the duel scene. All of this is convincingly acted, with vivid personifications of the different characters, and the singing is outstanding. Karl-Magnus Fredriksson, a natural actor, is a bit restrained, no doubt in accordance with the director’s instructions, but his vocal resources are impressive. He has developed from the light, lyrical, tenoral baritone I first heard nearly fifteen years ago singing Schumann’s Dichterliebe in what may have been a debut recital, to a full-voiced lyric-dramatic singer with a lot of bass in the voice, but still retaining the capacity to soften his singing to that tenoral sound when appropriate. He can compete today with the best Onegins, even his compatriot Peter Mattei, whom I saw in a TV-production of the opera some time ago. Even more impressive, in fact sensational, is Maria Fontosh as Tatiana. Having seen and heard her a number of times during the last few years, I was well aware of her capacity. She was an ideal Marie in The Bartered Bride last season, but here, in a vocally and dramatically more taxing role, she is magnificent. Russian-born but Swedish-trained she has the advantage of singing in her mother tongue, but the glorious tones she produces are world-class in any language. Her full-toned, lustrous high notes are in glaring contrast to her diminutive body, but her vocal armoury encompasses all aspects of superlative singing, from the faintest pianissimo whisper to fearlessly shining fortissimos. I once asked her if she would sing some Wagner and she said: “I will probably never sing Wagner.” But I wonder; she is still young and wise and one day she might ... She has warmth, she has stage presence, she is an actor – indeed she has everything! The applause after the letter scene was the longest I have ever heard after an aria at the Royal Opera. But her female colleagues are all very good, from the Olga of Larisa Kostyuk, guest from the Helikon opera and equipped with an impressive deep mezzo-soprano voice and real stage presence, to home grown veterans Marianne Eklöf and Ingrid Tobiasson, both singing as well as they have ever done. On the men’s side Jonas Degerfeldt’s lyrical tenor is well suited to Lenski’s small but central part and his aria is sensitively done. His tenor colleague Magnus Kyhle, a leading character singer for many years, steals the show in the second act party scene with Monsieur Triquet’s couplets, not least through his expressive body language. Lennart Forsén has a warm, smooth, sonorous bass voice, ideally suited to Prince Gremin’s short part, which in effect consists of his aria, one of the finest bass arias in all Russian – or indeed any – opera. His lowest notes are a bit sketchy and he can be over emphatic but otherwise he is admirable. The other bass, Björn Blomqvist, in the comprimario role of Zaretskij, has even less to sing, but whenever he appears he dominates the stage, visually and sound-wise. His large, booming voice was in unusually good shape on the opening night. To sum it up, the Royal Opera’s new Eugene Onegin is a resounding success on all accounts. It will play only three more times in June but will return in August and September and I advise every opera lover to book tickets before it’s too late. Readers who are able to listen to Swedish Radio programme 2, will have an opportunity to hear the performance broadcast live on Saturday, June 18th. Whichever option you choose, you can rest assured that you will hear the Tatiana of your dreams.